Sarah Bain’s eco-friendly memory games are as much a work of art as they are fun. Each wooden square has been decoupaged with a silhouette made from recycled magazines. She creates the game to have matches by pattern, but also uses different colors, and in some versions numbers of objects to provide even more learning and matching opportunities. Then Bain finishes the tiles with a water-based, non-toxic sealer and packages them in a handmade bag to keep the tiles organized in your game closet. Choose from anchors, butterflies, or a special domino-like counting memory game. Sarah Bain's eco-friendly memory games are as much a work of art as they are fun. Each wooden square has been decoupaged with a silhouette made from recycled magazines. She creates the game to have matches by pattern, but also uses different colors, and in some versions numbers of objects to provide even more learning and matching opportunities. Then Bain finishes the tiles with a water-based, non-toxic sealer and packages them in a handmade bag to keep the tiles organized in your game closet. 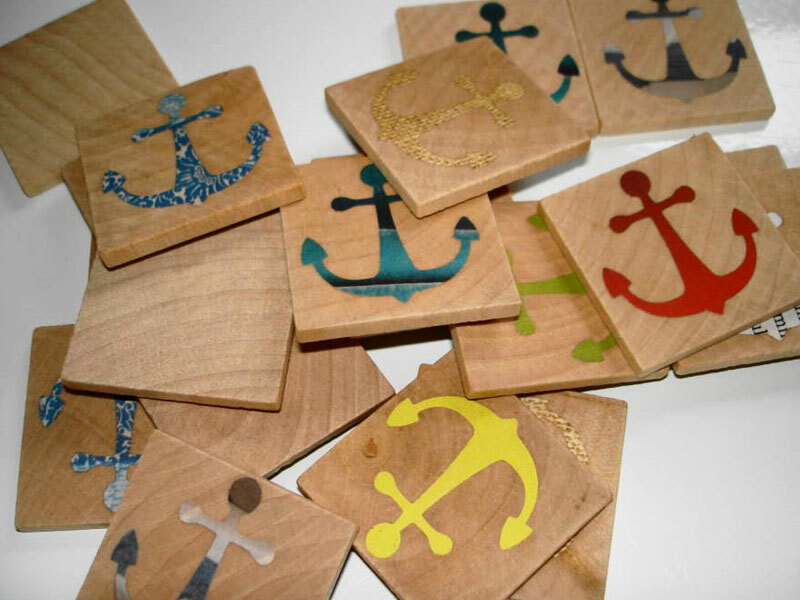 Choose from anchors, butterflies, or a special domino-like counting memory game.